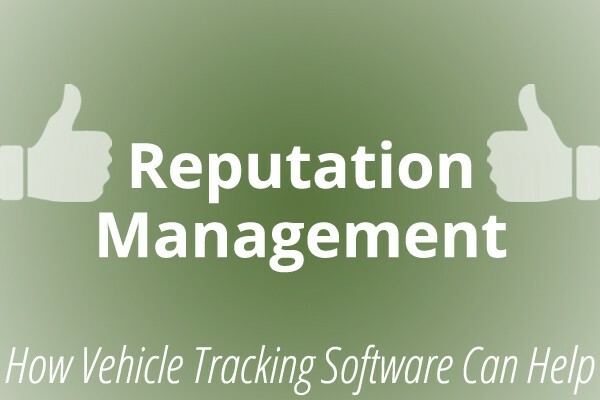 Effectively manage your company’s reputation with vehicle tracking software to stay on top of your competition. We live in a reputation based economy. According to the Reputation Institute, who you are matters more than what you produce. In a reputation based society consumers are more likely to purchase a product or service from a company with a good reputation; ultimately making a decision based on their perception of a company instead of what the company provides. For example, if you are interested in getting your driveway repaved, and a friend tells you about how disrespectful the company that did her driveway was, it is more than likely you will not hire that company. Even if they did an impeccable job at paving her driveway, you would not be inclined to hire a disrespectful company no matter how well they preformed their job. This can also apply when it comes to driving habits. If your company vehicles are being operated by poor drivers who do not follow the rules of the road, this could seriously effect your company’s reputation. When you are driving down the highway and someone is swerving in and out of lanes, or speeding past other cars it is likely you’ll notice. Now picture that car with your company logo plastered on the side and what it could potentially be doing to your company’s reputation. Vehicle tracking software can help you ensure your employees actions while on the road have a positive impact on your company to either improve or keep a good reputation. A company’s reputation is difficult for competitors to imitate. Also, it is an ongoing process. You need to uphold your good reputation by always paying attention to how it can further be improved to help you stay on top. Research has shown a strong relationship between a corporation’s perceived reputation and a customer’s purchase intent. If someone is on the fence about a purchase they will often consult people they know. Their family and friends can be the deciding factor and without a good business reputation an on the fence decision is often turned into no sale. Vehicle tracking software can help improve and keep an excellent reputation on the road. Your reputation can either help drive your sales up or bring them down, it’s up to you. Contact GoFleet today to learn more about our vehicle tracking software and the many benefits it can bring to your business.